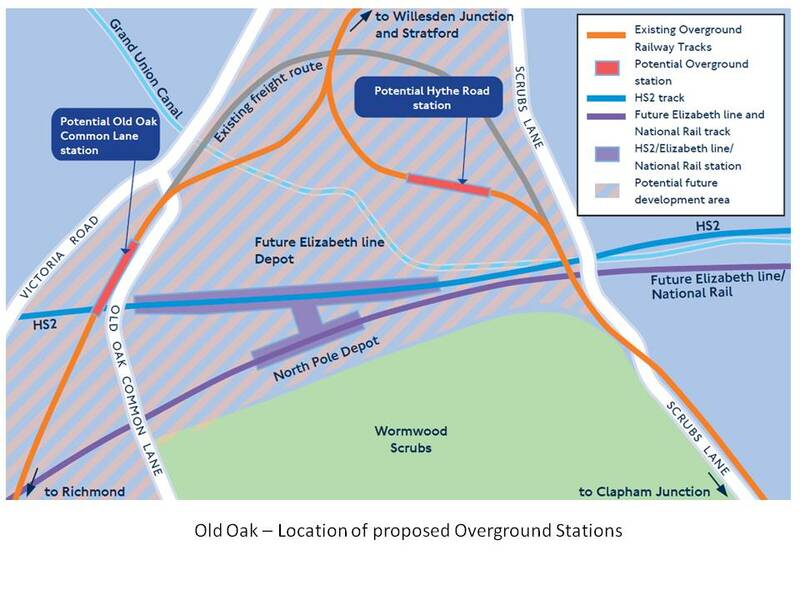 Transport for London (TfL) are holding a public consultation on proposals for two new Overground stations at Old Oak. The consultation is a short one, lasting from 16th October to 17th November 2017. The locations of these proposed new stations were consulted on back in 2014, in the early days of plans for Old Oak. The stations are intended to provide an interchange for passengers between the HS2/Queen Elizabeth Line (Crossrail) station at Old Oak Common and the London Overground network. This interchange will be less than ideal, as neither Overground station will be adjacent to the main station (the Hythe Road station will involve a 700m walk between the two). The business case for each station is still being developed and there is as yet no certainty on sources of funding. The preferred option for a Hythe Road station involves a new station and railway viaduct to the north of the existing embankment. The existing embankment would be removed, opening up access between the north and southern parts of Cargiant’s 43 acres – destined to become ‘Old Oak Park’ with 6,500 new homes. The StQW Forum will be submitting a response to the consultation. We will be arguing that it makes more sense to create a new station at ‘Westway Circus’, the location beneath the Westway roundabout at the southern end of Latimer Road. This proposals is advocated in the StQW Neighbourhood Plan, the RBKC Local Plan, and by the West London Line Group. Such a station would serve the expanding Imperial College campus and the new developments under construction by St James and by Stanhope (on the BBC TV Centre site). It would also improve public transport access for North Kensington and the StQW area, and relieve some of the traffic pressure on Wood Lane/Scrubs Lane. A new station at Hythe Road could await the time when ‘Old Oak Park’ is built out on the Cargiant site. Depending on the future of the London housing market post Brexit, there can be no certainty as to when Old Oak Park (and the residential towers granted approval along Scrubs Lane) will be both built and occupuied. Until that time, an Overground station at Hythe Road would serve a limited catchment area. The proposed Hythe Road station involves building a viaduct and new track across the Cargiant site. Project costs are estimated at £198m at 2023 prices. By contrast, a much simpler new station was added to the West London Line at Imperial Wharf a decade ago, at a cost of under £10m. Hence the cost/benefits of a station at Westway Circus would seem far greater than at Hythe Road. Ultimately, both could be provided and would be no closer together than halts on the East London Line, which has seen several new stations added at Shoreditch High Street, Hoxton, Haggerston and Dalston Junction. If you wish to contribute views to the StQW consultation response, please email to info@stqw.org by November 10th 2017. This entry was posted in Uncategorized on October 25, 2017 by Henry Peterson.